Had a doctor appointment yesterday for Riley. 3:15, we arrived at 3:10. 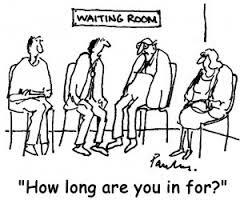 I’ve been to this doctor’s office before, normally she is quite prompt and waiting time is minimal. This day, not so much. Got into the room at 3:30, by 3:45, still no doctor. On a regular day, I don’t have back to back activities, but yesterday we had to be back at the high school by 4:00, no wriggle room. So at 3:45, we walked back to the front desk and I told the receptionist I would have to reschedule because we couldn’t wait any longer. I was pretty upset about the ridiculous waste of time. I left work early so we could make it to this appointment on time, but apparently only THEIR time is important, not mine and my son’s time. This is not the first time this has happened to me. 16 years and 3 kids, I’ve waited in doctor’s offices for the better part of 7 total months as best as I can calculate. Doctors do it on purpose, over schedule appointments to maximize income. It’s probably an exaggeration, but not much. (One could continue to argue it’s the insurance companies’ fault and then healthcare as a whole because my doctor doesn’t get reimbursed for the cost of the care they provide, and on and on and on…but that’s a rant I’m not willing to tackle). Back to MY complaining…they do this on MY DIME and MY TIME. And we are prisoners of their system. Trapped because we don’t have any other choice except an urgent care with NO appointment, and that’s the 7th level of hell, 3 steps beyond a regular doctor’s waiting room 4th level of hell. I’ve berated Brendan before for walking out of waiting rooms before because it just means you have to reschedule and then wait AGAIN. But now, having felt the freedom and downright joy at telling them Buh-Bye, I get why he’s done it. Before I was working full time and the boys were little, I didn’t mind waiting AS much. We’ve been going to the same pediatrician since Riley was 1. We’ve named all the fishes in the aquarium, mourned the ones that have passed on, seen office renovations, nurses and doctors come and go, and there are 32 steps to get from the 1st floor to the 2nd. That office is a well known place to our family. I LOVE our doctor, her and I were pregnant at the same time and had our babies just days apart. I was actually kind of irritated that she wouldn’t be in the office for Alex’s first newborn appointments. The nerve of some people. Aside from that, she’s kind, attentive and knowledgeable, everything you could want in a pediatrician. She knows more about my kids than most people. And most of it is pretty gross. But when I am in the waiting room with a sick kid watching the minutes click by… 15…30…45 minutes past my appointment time, I pretty much want to throat punch her by the time we see her. And I REALLY like her. Of course, she apologizes for making us wait and then usually tells us a story about how she had to send a 2 year old to the hospital earlier that day because the poor thing was so dehydrated from their awful case of leprosy and a collapsed lung, making my guilt go into overdrive because my son just has a fever, and here I am whining about waiting when my kids are sick or injured only once or twice a year that actually require a doctor’s visit. I’ve often wondered if she’s being honest or if she just knows how to find my sympathy buttons. Deathly ill babies? Pretty easy button to find. But alas, I don’t. I pay my co-pay and quietly go home. Then I sit by my computer and wait for the email survey I inevitably get about my appointment. I will honestly answer their questions in the hopes that it actually means something. That when I complain, changes will be made in their process. That when I applaud their timeliness, it encourages their behavior. A girl can dream. I sincerely try and am typically successful at being on time for almost everything in life, big events and little ones. I loathe tardiness. Kids late for school on a regular basis? I seriously want to throttle those parents and/or kids. (I MAY have an anger problem, jury is still out on that one). But in what world is your inability to manage time now MY problem? Being on time is a extremely large respect issue. I guess that’s what it comes down to: it doesn’t feel like Doctor’s offices have any respect for my time. (Although props to my dentist’s office, they run a tight ship, they are often waiting for us if I happen to come in a minute or 2 late). I understand medical care is not an exact science (ironically), but I am no fool, I’m betting there are some areas where improvements can be made. I know I’m screaming into the wind here, but honestly, I’m just trying to delay calling to reschedule the appointment I ran out on yesterday. Think they are mad at me? Have I mentioned it’s time to get my driver’s license renewed? Wish me luck!